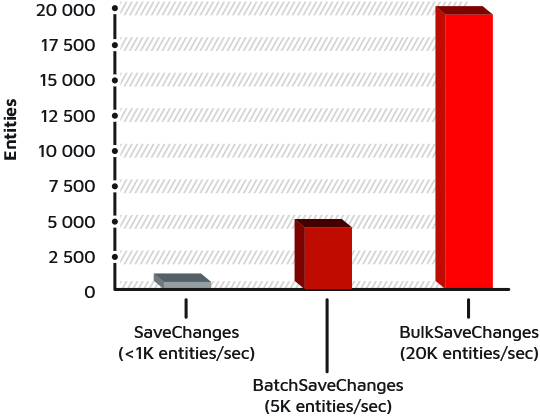 Use BulkSaveChanges to execute bulk operations when saving a large number of entities for maximal performance. Use BatchSaveChanges to combine SQL generated by SaveChanges to reduce database round-trip. Use BulkOperations to improve saving performance. Maximize your performance and customize how your entities are saved in the database. Batch SQL Command generated by SaveChanges in fewer command to reduce database round-trip. Execute UPDATE and DELETE statement directly in database with LINQ Query without loading entities in the context.